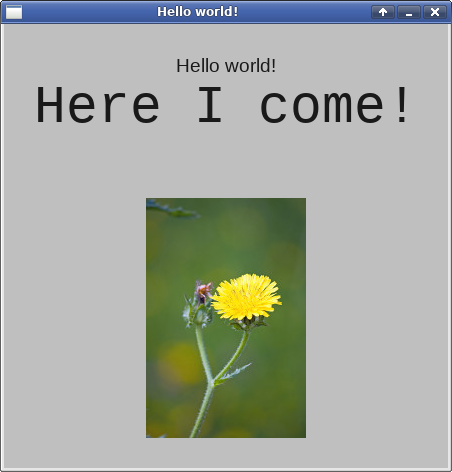 The following “hello world” program displays the above application window. // will stop, but not immediately. Some cleanup tasks must be done. // and the display server's connection thread stops. // The guard object must be declared before the main_window object. // The main application window. // get_layoutmanager() will give us, here. // that's about to get created. // to a non-default font. // Create a factory for the second row. // Create an image element. // grid layout manager for the new main window. // above, it expects to see a gridlayoutmanager. // orderly on_delete() does, will also work. // it'll still be running (but doing nothing of importance). // display connection completely goes away. // Set the window manager class instance and resource identifiers. // managers use for window-specific settings. // it gets a "close window" message from the display server. // Show the main window, and all of its display elements. // Wait until the close window message is received.